Posted by Ada Wang on 2/5/2018 2:33:38 PM. Adobe drm epub can be only displayed on devices supporting adobe drm. Nook and ibooks drm epub are restricted to fixed nook or iOS devices. In order to read drm epub on more popular devices, such as kindle, you have to remove drm from epub and then choose to convert epub to a more widely-accepted format, like pdf. The following part I will explain specifically why you should convert drm epub to pdf and how to convert three kinds of drm epub to pdf. 1. PDF format can be accessed on more popular devices, like Kindle. 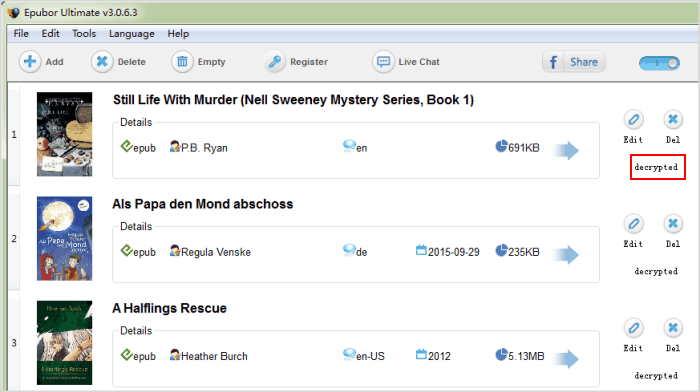 By converting drm epub to pdf, you can freely read books on almost any devices. 2. PDF files can be printed out. If you want to print drm epub, you can choose to convert drm epub to pdf. 3. Books with images, diagrams, or anything else like that, will be displayed better with pdf format. Want to know more reasons? If you want to know more reasons why we need to convert epub to pdf, or the detailed defferences between the two common ebook formats, you can read this in-depth guide convert epub to pdf. Usually purchased epub books from many main online stores, like nook, sony, kobo, google play are protected by two kinds of drm, adobe drm and nook drm. (Of course this list excludes ibooks epub because ibooks epub is protected by its unique ibooks drm). This part I will show you detailed steps about how to convert adobe and nook drm epub to pdf. The next part will refer to convert ibooks drm epub to pdf. For converting adobe and nook drm epub to pdf, I highly recommend Ultimate Converter to you. It's easy to use and can solve both of these two problems: decrypt drm restrictions and then convert epub to pdf format. You can have 30 days free trial. 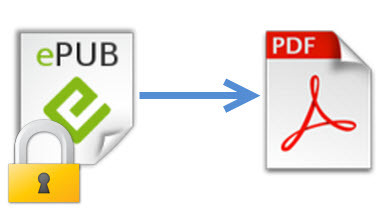 After you download and install this tool, here we come to steps for converting drm epub to pdf. Launch this tool and then follow the instructions to load your adobe or nook drm epub books, or you can click "Add" button or simply drag books into the main interface. For adobe drm protected epub books, your books will be decrypted automatically as soon as you load your books successfully into this tool. 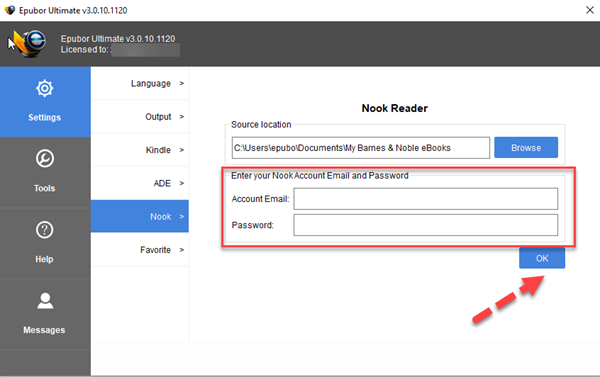 For nook drm epub, it will pop up a window requiring you to input your Nook account and password. Just input the correct information and click "OK", your books will be decrypted. 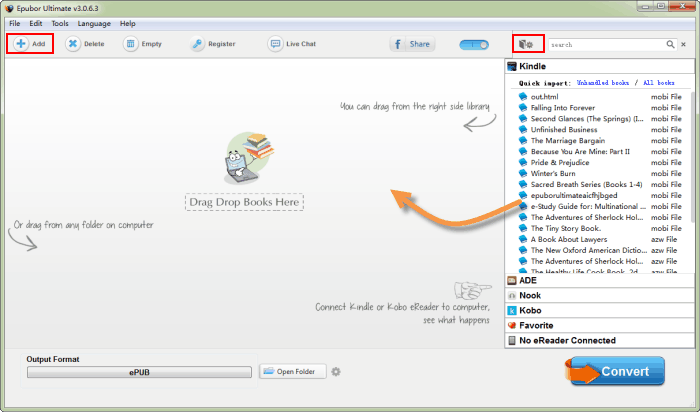 Tips: Make sure you can view your books in ADE or nook for pc first before removing drm. More information click how to remove drm from epub. Simply choose pdf as the output format at the left bottom and then hit the big "Convert" button to start the conversion. When you see it shows the state of "Succeeded" right beside the books information item it means your epub books have been successfully converted to pdf. And then the output folder will pop up automatically, you can find all your converted files there. It's so simple, right? Apart from this point, you may find it only takes you a few seconds to finish the whole conversion. 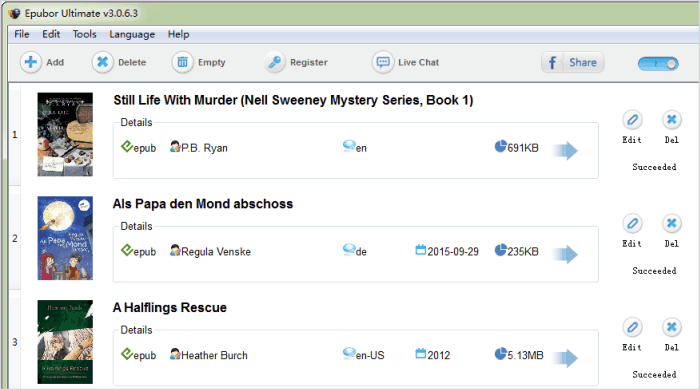 You can even convert books in batch without having to add and convert books one by one. Sorry to tell you that the above-mentioned software couldn't help you remove drm if your books are bought from ibookstore. We all know that books purchased from ibookstore are protected by its unique Apple Fairplay DRM. So how to deal with the ibooks drm epub if you want to convert them to pdf and then read them on other popular devices except the iOS devices? After searching the Internet, finally I do find a tool, named Requiem, which can remove ibooks drm. You can have a try. Step 1: Install iBooks DRM Removal. And then launch it to follow instructions to remove the Apple Fairplay DRM. Helpful tips: This tool only works with iTunes 10.5/10.6, and the version after Requiem 3.3.6 even delete the iBooks decryption feature. It doesn't work with iTunes 11.0.2 on Mac OS X 10.6.8. It seems a little complicated for you to deal with ibooks drm, so I suggest you to think twice before deciding to purchase books from ibookstore. Step 2: After successfully remove drm from ibooks epub, you can still apply this metioned tool ultimate converter to continue your job converting drm free epub to pdf. It will save you a lot of trouble if your epub books are drm free.